Green beans, like all vegetables, is a healthy and tasty part of a wholesome diet. Beans are an excellent source of protien as well as vitamins. Much research has shown that they can play a vital role in our health if consumed on a regular basis. They also contain adequate amount of fiber and this is the reason for their ability to prevent cholesterol increase. Green beans have a low amount of calories, yet are packed with other vital nutrients. Green beans contain high amounts of vitamin K1 which activates Osteocalcin, which is the major non-collagen protein present in the bone. Osteocalcin anchors calcium molecules inside the bone and induces strength. 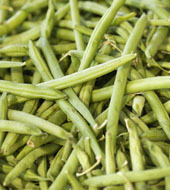 Green beans are helpful in maintaining cardiovascular health, and lessen the chances of getting blockages in arteries. Green beans contain oxalic acid, a naturally occurring substance found in some vegetables which may crystallize as oxalate stones in the urinary tract in some people. It is therefore recommended that individuals with known oxalate urinary tract stones should avoid eating vegetables belonging to the brassica and fabaceae family. Green beans are one of nature’s whole foods that can be found at most grocery stores. These are popular vegetables which can easily be grown at home and require very little effort. If you are getting it from a market, the beans should be firm, fresh and clean. Green beans are an excellent source of nutrients and should be apart of a regular healthy diet.